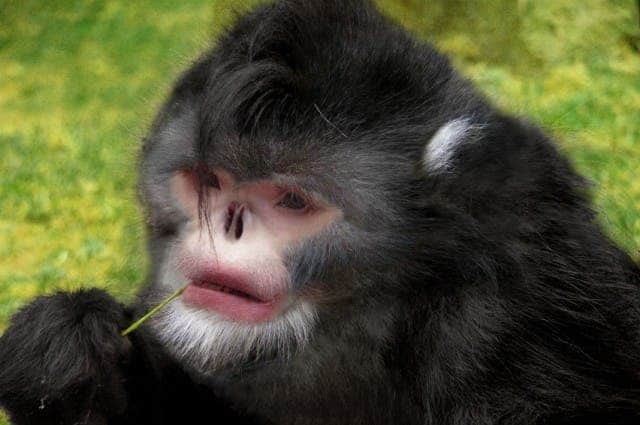 Rhinopithecus strykeri, also known as the Myanmar Snub-Nosed Monkey or Sneezing Monkey was discovered just a few years ago, in 2010. Their small numbers and elusive behaviors made them very hard to find, and since them, even harder to study. All the species of snub-nosed monkeys have short stubby noses, but R. strykeri’s is just a little too much – their nostrils are turned upwards so much, that when it rains, droplets actually go into their noses, causing them to sneeze – hence the nickname. This of course, can get them into a lot of trouble, making them easier to find by predators – so they simply hide their face in their knees and patiently wait for the rain to end. The species is critically endangered – they number less than 300 individuals, and their numbers are decreasing more and more. But it’s not predators which are the cause, it’s humans – the usual suspects when it comes to killing off species. Illegal loggers destroy the habitat more and more for their own profit, and there is no authority to impose the law there. Local tribes often get into conflict with the loggers (sometimes violent conflicts), but this is something way above their heads. On March 28, Fauna & Flora International (FFI) released a special video of about two dozen of these monkeys traveling through the forest’s canopy – this is in fact the first video of these snub nosed monkeys, which makes it extremely special. This video provides conservationists with critical information about the species. While many leaf-eating monkeys live in small families, this shows a relatively large group of them living together – highlighting just how little we understand of this remarkable, almost extinct species.